Almost 10 years ago, Osama bin Laden ghosted away from the Afghan battlefields. Afterward, it was as if the doomsday sheik had slipped into a twilight zone in which the only proof that he was alive was the chilling voice on a spool of tape, the occasional video image  and the string of terrorist outrages and wars around the globe that claimed inspiration from him and his cause. At 11:35 p.m. E.T. on May 1, 2011, President Barack Obama made a dramatic television appearance to announce that bin Laden, whose capture or killing was the top priority of CIA chief Leon Panetta, was dead. The leader of al-Qaeda, Obama said, had been tracked by way of intelligence sources in August 2010, and earlier on May 1, a team of U.S. operatives found him at a compound in Pakistan in the town of Abbottabad, 75 miles outside of Islamabad and the home of the Pakistani army's training academy. The location  not in the increasingly militant heartland of Punjab and not too far from the unsettled frontier and tribal areas  was a peaceful, quiet patch, and the perfect place to hide until May 1. After a brief firefight, the fugitive leader of al-Qaeda was killed and his body retrieved. The long search for the man seen as the embodiment of evil in the U.S. and much of the West was over. Outside the White House, despite the late hour, a group of young people gathered to cheer. George W. Bush, under whose presidency the 9/11 attacks occurred, released a statement saying, "The fight against terror goes on, but tonight America has sent an unmistakable message: No matter how long it takes, justice will be done." 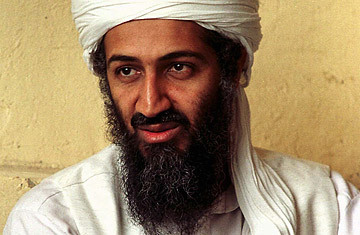 Osama bin laden was not born to the role of terrorist ringleader. He wasn't brilliant. He didn't give great speeches. He lacked force of personality. Before he became notorious, he tended to make almost no impression at all on the people he met. He was not charismatic. He was far too regular for that. You might expect from a supreme mass murderer a volatile temper, an overinflated sense of self. He had neither of those traits. He had a diabolical mind, clearly, but not a diabolical temperament. By the accounts of those who knew him, bin Laden was serene and modest in his manner. "He was gentle and very genuine," says Issam al-Turabi, a former friend of bin Laden's in Sudan. "He was never nervous, never aggressive, always calm." Bin Laden's seeming temperance made his manifest bloody-mindedness all the harder to fathom. Here was a man who was attentive to those around him, considerate of their needs and respectful of their views, yet who believed in and facilitated killing wholesale. The gap between demeanor and deed can be explained in part by the distinction bin Laden made in people. Fellow Muslims were the only ones who mattered; infidels were loathsome. Plenty of bigots, of course, get through life without murdering those they hate. So bin Laden's motivation had to go deeper than antipathy  deeper than ideology too, since many Muslims shared his beliefs without resorting to his brutal means. Were the seeds of evil always present within bin Laden? His early history gives no hint of that. Instead, it would seem that bin Laden's life  and the strong personalities to which the impressionable and fatherless young man was exposed  took him to the outermost extreme, one graduated step at a time. At points in between, he might have returned to the fate to which he was born, that of a prosperous merchant, or perhaps more to his liking, that of a gentleman farmer. That his path led instead to repudiation, exile and, finally, death was his own doing, but he blamed his enemies for his alienation nonetheless. His grudge against Western and Arab powers, in that sense, was personal. How ironic that a man who contained his ego so well in private company would wind up a megalomaniac on the world stage. How, precisely, bin Laden's Syrian mother and Saudi father got together is a matter of dispute. According to a relative, the two met after Mohammed bin Laden, then a prosperous contractor in Saudi Arabia, visited the Syrian city of Lattakia in the mid-1950s. There, according to this account, Mohammed developed a friendship with Ibrahim Ghanem, whose fetching sister Alia he fell in love with, married and took home to Saudi Arabia. But Ahmad al-Sayed, the elderly mayor of Alia's home village, Jabaryoun, eight miles from Lattakia, says Alia was originally the bride of a Saudi prince; when he died, she wed bin Laden. In any case, Mohammed and Alia had at least one thing in common: humble roots. The Ghanem clan was poor in those days  how poor, says al-Sayed, "you cannot imagine." As for Mohammed, once a porter in coastal Aden, he had left his native Yemen as a destitute young man to make his fortune in Saudi Arabia. It was no small fortune. Having befriended the kingdom's founder, King Abdul Aziz ibn Saud, Mohammed won precious government contracts for highways, palaces and, most prestigious of all, renovations of religious sites in Mecca and Medina, the cities holiest to Islam. With his 22 wives  never more than four at a time, in accordance with Muslim law  Mohammed had 54 children. Osama was born  in the capital of Riyadh in 1957  somewhere in the middle; his sprawling family couldn't identify his ranking precisely. Even master terrorists start off small and helpless. A woman from Jabaryoun remembers holding bin Laden as an infant: "He cried a little, but he used to smile to anyone who bantered with him." As he grew, she says, he displayed "a distinguished intelligence." Until he was 18, bin Laden, locals say, spent summers with his mother in Jabaryoun, a remote, hardscrabble village of 500 people in a region blanketed with orange and olive trees. Villagers remember bin Laden as a mild-mannered boy who, according to one, "didn't like noise or light." Another neighbor, who like others refuses to be identified, says bin Laden was "quiet, humble and polite. When he spoke, he was convincing, though he spoke little." Even as a boy, bin Laden was particularly devout. A male relative says he liked to discuss religious matters with local clerics. "He carefully listened to and understood his debater before giving any answer. He never gave a swift answer. He used to take his time before uttering his reply."